Built as a hybrid device for small and medium organizations and small offices, the TS-932X 9-Bay NAS Enclosure from QNAP takes up less desktop space compared with other models in the same class, thanks to its drive layout, and presents a control panel embellished with brushed-metal aluminum and LED indicators. It is powered by a 1.7 GHz Alpine AL-324 Quad-Core processor and 8GB of 2400 MHz DDR4 RAM, which can be upgraded to 16GB. Network connectivity is achieved using the two 10GbE SFP+ and two Gigabit Ethernet ports. The 10GbE ports can drive file transfers with sequential reads of up to 1966 MB/s and sequential writes up to 835 MB/s, while encrypted file transfers deliver read speeds of up to 1148 MB/s and write speeds of up to 478 MB/s. This 9-bay enclosure has 5 drive bays that can natively house both 3.5" and 2.5" SATA III hard drives or SSDs, plus four 2.5" SATA III drive bays that use SSDs for caching with auto tiering that continuously optimizes storage utilization across high-performance SSDs and high-capacity SATA drives. 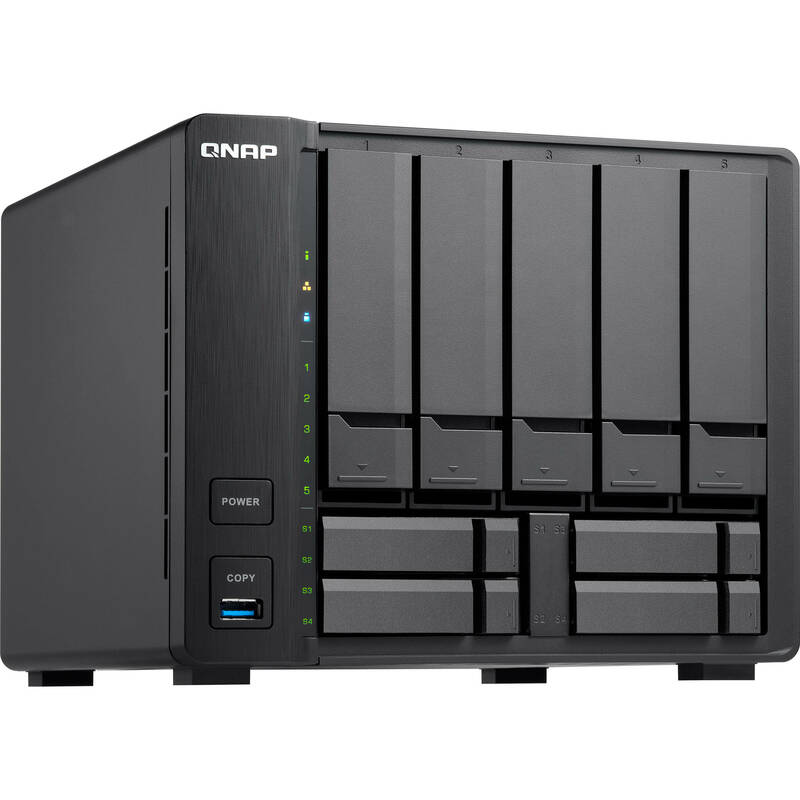 Using the three 5 Gb/s USB 3.0 Type-A ports, this QNAP NAS can be connected to other QNAP devices, including two UX-800P or UX-500P expansion enclosures. Additionally, the TS-932X is validated with FIPS 140-2 AES 256-bit encryption, helping to prevent sensitive business data from unauthorized access and breaches. QNAP has engineered this NAS to support JBOD and single disk modes, plus a variety of RAID modes, including RAID 0, 1, 5, 6, 10, 50, 60, and + hot spare, each of which offer data redundancy, speed, or a combination of both. It operates using an included 120W AC adapter and includes two Ethernet cables, a power cord, flat head screws for 3.5" HDDs, and flat head screws for 2.5" HDDs. Protection is provided by a limited 2-year warranty. You may be surprised with the size of the TS-932X, which is a 9-bay NAS with a similar appearance as a regular 4-bay/6-bay NAS. The TS-932X strikes a balance between storage capacity and performance, making it a perfect companion for small and medium organizations and small offices. Design details also include succinct LED indicators, a brushed-metal aluminum control panel, and a drive bay layout that efficiently streamlines the physical footprint of the NAS. The TS-932X is equipped with a Annapurna Labs, an Amazon company 1.7 GHz Alpine AL-324 Cortex-A57 Quad-Core processor with 8GB of DDR4 RAM (upgradable to 16GB) and supports SATA III 6 Gb/s. When processing AES 256-bit full NAS volume encryption, the TS-932X also provides fast encryption performance while ensuring the safety of sensitive business data stored in the NAS. The TS-932X comes with a pair of 10GbE SFP+ ports to fully support 10GbE high-speed networks, delivering a speed increase for virtualization tasks, fast backup & restoration, and large data applications. The TS-932X provides four 2.5" bays for SSD caching to improve the workflow of random IOPS demanding applications. Qtier Technology empowers the TS-932X with automatic tiering that continuously optimizes storage utilization across high-performance SSD and high-capacity SATA drives. Qtier 2.0 features IO-awareness that empowers SSD-tiered storage with a cache-like reserved space to handle burst I/O in real time, greatly maximizing the advantages of SSD. Essential for NAS data protection, snapshots help protect your data by fully recording the NAS system state and the metadata. You can use Storage & Snapshots Manager or File Station to manage snapshots and quickly restore the system to its normal state if an error occurs. QNAP snapshots are block-based and only record the changed data. Not only does this save storage space but also reduces the time required to back up and restore data. QNAP 10GbE/NBASE-T unmanaged switches allow you to upgrade your network environment at a cost-effective price. With a 10GbE network, you can enjoy fast transfer speeds, empower bandwidth-demanding tasks like virtualization, and enable simultaneous real-time access to large NAS-based files using multiple workstations (good for video editing and multimedia). QNAP also provides a 10GbE PCIe network expansion card for Windows/Linux systems to take advantage of high-speed LAN environments. Container Station integrates LXC and Docker lightweight virtualization technologies. You can download apps from the built-in Docker Hub to import/export container apps and manage access controls, enjoying the benefit of easy installation, transferability, and high-efficiency, as well as rapidly deploying application services across several platforms including the cloud, servers, and PCs. With multiple modularized applications and functions, QTS enhances management efficiency, personal productivity, multimedia, and much more, making your NAS experience easier, efficient, and more flexible. The built-in App Center, with hundreds of install-on-demand apps, also opens up vast potential for extensive NAS functionality. Qboost provides a NAS optimization tool that helps accelerate applications, free up system resources, and schedule applications. The TS-932X centrally stores data and files, and supports SMB/CIFS, AFP, and NFS protocols for file sharing across Windows, Mac, and Linux/UNIX networks. Coupled with Qsync (a utility that turns a QNAP NAS into a safe, high-capacity data center for file synchronization), files uploaded to the TS-932X will be made available for all linked devices, such as computers, laptops, and mobile devices. You can sync shared folders and team folders for group file sharing to enhance the flexibility of team projects and collaboration. Files can be centrally managed using File Station, including files from mobile devices and optical disc drives. File Station also allows you to mount a remote NAS, and transfer files between your NAS and public cloud services for greater convenience. The TS-932X provides a reliable, flexible backup & disaster recovery solution to assist organizations in routine backup jobs with cost-efficiency and high productivity. Block-based snapshots are a dependable method for protecting data in the face of the growing threat of ransomware. Snapshots can be taken by schedule or manually and then backed up to other NAS/servers to provide an all-encompassing backup solution. Use the free QNAP NetBak Replicator utility to back up/restore files from Windows computers. Time Machine is also supported for Mac users. It is easy, fast, and convenient. Consolidates backup, restoration and synchronization functions (using RTRR, rsync, FTP, and CIFS/SMB) for easily transferring data to local, remote, and cloud storage spaces as a comprehensive data storage and disaster recovery plan. QNAP's QVR Pro surveillance solution allows you to arrange a dedicated, independent storage space for surveillance data on the TS-932X and leverage the advantages of storage manageability from QTS. With QVR Pro, camera management, storage space allocation, camera live view, and playback is greatly simplified. You can also use the QVR Pro Client mobile app to monitor your cameras from anywhere, or use USB webcams as ONVIF network camera with the QUSBCam2 app. QVR Pro is compatible with over 5000 cameras, provides 8 free IP camera channels, and supports up to 16 IP camera channels. Hot swap lower capacity drives with larger capacity drives so that your QNAP NAS can grow with your business. Connect two UX-800P or UX-500P expansion enclosures and use the Storage & Snapshots Manager to easily handle NAS capacity expansion. QNAP VJBOD (Virtual JBOD) is network-based JBOD, allowing you to expand the storage capacity of your QNAP NAS with unused storage space from other QNAP NAS. The unused storage capacity of the TS-932X can be mounted as local disks of other NAS, and you can create virtual storage pools and volumes for operating NAS services to maximize storage utilization. Note: ARM-based NAS does not currently support the VJBOD "Host" function to utilize other NAS storage space. Enable remote access through NAS-hosted web browsers to access local LAN resources without needing complex VPN settings. The TS-932X is compact in size, offers large storage potential, and is kept cool by an effective airflow and thermal design. Heat is efficiently dissipated, ensuring the TS-932X performs smoothly even under the heaviest loads. Box Dimensions (LxWxH) 15.15 x 13.65 x 10.05"